At its most basic level, a flap is a portion of tissue that can be dissected, elevated, and inset into a nonanatomic position as a consequence of its vascular supply and outflow. By this definition, flaps may be composed of any combination of skin, fascia, muscle, and bone. Complexity may range from a random pattern skin flap based on a subdermal plexus to a fascio-osteocutaneous free flap supplied by a known arterial perforator. Free tissue transfer is defined as the vascular dissection and detachment of an isolated and specific region of the body (eg, skin, fat, muscle, bone) and transfer of said tissue to another region of the body, with anastomosis of the divided artery and vein to a separate artery and vein located at the site of the defect. The latter portion of this procedure ensures the perfusion and drainage, and ultimately the survival, of the flap. This ability to transplant living tissue from one region of the body to another has greatly facilitated the reconstruction of complex defects. Free tissue transfer has become commonplace in many centers around the world. The numerous advantages of this technique include stable wound coverage, improved aesthetic and functional outcomes, minimal donor site morbidity, and the ability to utilize vascularized tissue from remote parts of the body that are outside the zone of injury (trauma, malignancy, infection, irradiation, etc). Since the introduction of free tissue transfer in the 1960s, the success rate has improved substantially, currently being 95-99% among experienced surgeons. This article provides a framework to facilitate the planning, execution, and monitoring of free flaps. For more information on various flap procedures, see Flaps. Free tissue transfer currently is used for the reconstruction of complex defects and disorders throughout the body. As with all techniques in plastic surgery, adherence to the basic principles and concepts of reconstruction is essential. The previously mentioned "reconstructive ladder" allows the plastic surgeon to proceed through a cognitive, step-wise progression of reconstructive options of increasing complexity. Generally speaking, the simplest solution is preferable; however, there are specific instances in which this line of logic is bypassed by the "reconstructive escalator," with a free tissue transfer being deemed the optimal and safest solution. The hierarchy of needs regarding a wound defect starts at wound coverage, with aesthetic outcome very much a secondary concern. Plastic surgery is rarely binary, with wound coverage and aesthetics infrequently seen as mutually exclusive goals. Therefore, depending on surgical expertise, a combination of aesthetic and functional considerations occasionally warrant performing more complicated procedures. These considerations are most evident following ablative procedures for cancer, for restoration of function, and for aesthetic appearance. Numerous clinical situations exist in which the use of a free flap is justified and beneficial. Refinements in mandibular reconstructions have led to the use of the free fibular flap, which results in improved appearance and function of the neomandible (see the image below). The fibula free flap is well suited to anterior arch defects. The complete arch can be rebuilt following shaping of the bone. Preoperative preparation is an essential component of the successful free tissue transfer. Preoperative evaluation includes analysis of the recipient site, consideration of available donor sites, and the clinical status of the patient. Proper patient selection is of utmost importance when analyzing outcomes. The specific factors are reviewed below. Factors related to the recipient site include the size, depth, and location of the defect; quality of the surrounding tissue; exposure of vital structures or hardware; zone of injury; presence of bacterial colonization or infection; previous irradiation;  and functional and aesthetic considerations. Factors related to the donor site include appropriate tissue match; length of the vascular pedicle; caliber of recipient vessels; surface area, volume, and thickness of the flap; and donor site morbidities. The clinical status of the patient depends on a variety of factors that also may impact the free flap. These include age, nutritional status, tobacco usage, and the presence of underlying comorbidities (eg, diabetes mellitus, cardiopulmonary disease, peripheral vascular disease). Although advanced age and tobacco use are not contraindications to free-flap operations, poor nutritional status can impede wound healing and recovery. Patients with poorly controlled diabetes mellitus and peripheral vascular disease require adequate glucose control and may need revascularization procedures prior to free tissue transfer. Surgical clearance by a medical physician is recommended for patients with multiple medical problems. Specific donor tissues are variable, and donor sites are chosen based on recipient site requirements. Available tissues include muscle, musculocutaneous, fasciocutaneous, osteocutaneous, and bone flaps. In general, free muscle flaps are indicated for soft tissue coverage of bone and synthetic materials and to obliterate a large dead space. In the trauma patient, the timing of free-flap reconstruction is of prime importance. Free tissue transfer within 3-7 days allows time for adequate debridement, declaration of the zone of injury, and prevention of chronic bacterial colonization, [12, 13] whereas it was previously thought that delayed reconstruction (more than 72 hours after the injury) independently increased the risk for postoperative infection or flap loss. 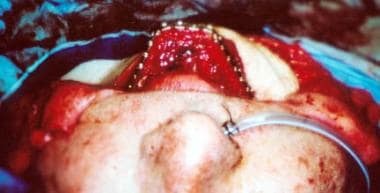 Immediate free-flap reconstruction is often preferred for the acquired operative wound, especially in the presence of vital structures and hardware and for aesthetic and functional considerations. Consider delayed free-flap reconstruction when oncologic concerns are present. Other factors that require consideration include choice of anesthesia and patient position for the operation. Anesthetic options include general, spinal, and epidural, with the choice depending on the nature and location of the reconstruction. General anesthesia is preferred for most patients and can be administered via oral, nasal, or tracheal routes. Oral intubation is preferred for trunk and extremity reconstructions; however, nasal and tracheal intubations are preferred for most reconstructions involving the head and neck. Spinal anesthesia occasionally is used for lower extremity free flaps and has the advantage of providing a transient sympathectomy that promotes vascular dilation. Epidural anesthesia is used primarily for postoperative pain management. Patient positioning may require an inflatable beanbag, Wilson frame, or Mayfield headrest. The inflatable beanbag is useful in placing the patient in the lateral decubitus position (eg, when harvesting a latissimus dorsi flap). The Wilson frame or chest rolls benefit patients in the prone position, allowing chest expansion during general anesthesia. The operative portion of the free tissue transfer requires absolute attention to detail. Numerous factors must be considered to predictably obtain a successful outcome. These include use of appropriate medications and solutions, properly functioning equipment and instruments, anastomotic issues, and flap insetting. Required medications include intravenous antibiotics, antibiotic solution for wound irrigation, intravenous heparin administered 5 minutes prior to free flap harvest, 4% Xylocaine for topical vasodilatation, and heparin solution (100 U/cm3) for luminal irrigation. Select studies evaluating the effects of various intraoperative anticoagulants have demonstrated that the flap loss rate is lower in patients receiving a heparin bolus of 5000 U only or a heparin bolus of 2000-3000 U followed by postoperative infusion. Low-dose heparin does not increase the risk of hematoma or postoperative bleeding. However, a consensus has yet to be reached regarding the ideal chemoprophylactic regimen to minimize thromboembolic events. Some authors advocate the use of daily aspirin versus ketorolac as an alternative and/or adjunct to heparin or Lovenox therapy. Other medications that may be used include Decadron 4-8 mg to reduce edema and swelling (especially for reconstructions of the head), papaverine as an alternate vasodilator, and streptokinase or urokinase for lysis of intraluminal thrombus. The nursing staff and primary surgeon must inspect the microinstruments and microscope to ensure proper function. The diameter of the artery and vein, both for the flap and recipient site, should be 1-3 mm to permit adequate inflow and outflow. Blood vessels must be free of all loose adventitia, and the vascular approximation must be tension free. Acland clamps should facilitate vascular exposure and manipulation. Complete the anastomosis using either a vascular coupler, or sew it by hand. The coupler has demonstrated its usefulness, especially for venous anastomoses, in improving patency and decreasing operative time. Complete the hand-sewn anastomosis using 8-0, 9-0, or 10-0 nylon sutures placed in an interrupted fashion. In general, anastomose larger-caliber vessels (2-3 mm) using 8-0 or 9-0 sutures and smaller-caliber vessels (1-2 mm) using 9-0 or 10-0 sutures. Following completion of the anastomoses, the flap must be properly inset. Inspect the vascular pedicle for kinks, twists, and compression and to ensure that no tension is present across the anastomosis. Inspect the distal aspect of the flap for arterial and venous bleeding. Use a Doppler unit to assess arterial and venous flow through the pedicle and in the flap. Finally, recheck the vascular pedicle to ensure that there is a gentle, nontwisting course for the vessels before completing the final suturing of the flap, especially if the patient's position has been changed. Place a closed suction drain under the flap away from the anastomoses and suture the flap in position. Frequent postoperative evaluation remains the gold standard for assessing flap viability. Techniques to monitor the free flap depend on the tissue composition and location of the flap. Specific characteristics to track include color, capillary refill, turgor, surface temperature, presence of bleeding, skin graft adherence, and auditory assessment of blood flow. Adjunctive measures for flap monitoring include the use of pulse oximetry, external Doppler ultrasonography, external cutaneous paddles (for buried flaps), laser Doppler flowmeter devices, and pulsed Doppler ultrasonography. Use of these techniques depends on whether the flap has a fasciocutaneous component, is covered with a skin graft, or is buried and inaccessible to visual assessment. For the fasciocutaneous, adipocutaneous, musculocutaneous, and osteocutaneous flaps, surface characteristics are important. Normal flap color is similar to that of the recipient site. Normal capillary refill is 1-2 seconds. Surface temperature of the flap can be monitored using adhesive strips (for an accurate number) or the back of the hand (to provide a comparative assessment with the surrounding skin), although the latter would require serial assessments by the same examiner. Problems with arterial inflow are suggested when the flap is pale relative to the donor site and cool to the touch and when capillary refill is delayed or absent. Problems with venous outflow are suggested when the flap is congested and edematous and when capillary refill is brisk and rapid. Color and appearance of congested flaps can vary depending on whether the congestion is mild or severe and ranges from a prominent pinkish hue to a dark bluish purple color. Surface Doppler assessment for flaps with a fasciocutaneous component may yield a false-positive result by picking up signals from surrounding or deep blood vessels. Characteristics of blood from the flap following pinprick also can provide clues. Dark venous blood suggests venous occlusion, and absence of bleeding suggests arterial occlusion. The muscle flap covered with a skin graft often is easier to monitor. Surface temperature and capillary refill generally are not used in these situations; however, color, turgor, skin graft adherence, and Doppler signals are useful. Signs of venous outflow obstruction include flap congestion and edema, dark blood on pinprick, and loss of the venous Doppler signal. Signs of arterial occlusion include a flat and pale flap, poor skin graft adherence to the flap, no bleeding on pinprick, and loss of the arterial signal. Following recognition of flap compromise, immediately transport the patient to the operating room for exploration. Inspect the vascular pedicle for kinks and compression and assess the patency of the anastomosis. Identification of thrombus requires separation of the vessels at the anastomosis. Perform embolectomy proximally and distally, using a number 2 or 3 Fogarty catheter. Administer intra-arterial streptokinase or urokinase at a dose of 50,000-100,000 U as necessary. Following restoration of adequate circulation, inset the flap again and maintain the patient on intravenous heparin or dextran. Failure to restore adequate circulation requires flap removal. Free tissue transfer represents an adaptable tool within the armamentarium of the plastic surgeon for the coverage of complex tissue defects. Considerable thought must be invested, however, prior to this surgical intervention, including with regard to the nature of the defect, the clinical status of the patient, the technical abilities of the surgeon, the ability of the operating facility to provide adequate postoperative care and flap monitoring, and, most importantly, whether a simpler solution exists that could produce a comparable reconstructive outcome. As the highest rung on the reconstructive ladder, free tissue transfer is an incisive tool that must be used judiciously. Mathes SJ, Nahai F. Clinical Applications for Muscle and Musculocutaneous Flaps. St Louis: Mosby; 1982. Fischer JP, Sieber B, Nelson JA, Cleveland E, Kovach SJ, Wu LC, et al. Comprehensive outcome and cost analysis of free tissue transfer for breast reconstruction: an experience with 1303 flaps. Plast Reconstr Surg. 2013 Feb. 131(2):195-203. [Medline]. Blondeel N, Vanderstraeten GG, Monstrey SJ, et al. The donor site morbidity of free DIEP flaps and free TRAM flaps for breast reconstruction. Br J Plast Surg. 1997 Jul. 50(5):322-30. [Medline]. Campisi C, Davini D, Bellini C, et al. Lymphatic microsurgery for the treatment of lymphedema. Microsurgery. 2006. 26 (1):65-9. [Medline]. Bourget A, Chang JT, Wu DB, Chang CJ, Wei FC. Free Flap Reconstruction in the Head and Neck Region following Radiotherapy: A Cohort Study Identifying Negative Outcome Predictors. Plast Reconstr Surg. 2011 May. 127(5):1901-8. [Medline]. Garcia RM, Hadlock TA, Klebuc MJ, Simpson RL, Zenn MR, Marcus JR. Contemporary solutions for the treatment of facial nerve paralysis. Plast Reconstr Surg. 2015 Jun. 135 (6):1025e-1046e. [Medline]. Kroll SS, Schusterman MA, Reece GP, et al. Choice of flap and incidence of free flap success. Plast Reconstr Surg. 1996 Sep. 98(3):459-63. [Medline]. Nahabedian MY, Singh N, Deune EG. Recipient vessel analysis for microvascular reconstruction of the head and neck. Ann Plast Surg. 2004. 52(2):148-55. [Medline]. Taylor GI, Corlett RJ, Dhar SC, Ashton MW. The anatomical (angiosome) and clinical territories of cutaneous perforating arteries: development of the concept and designing safe flaps. Plast Reconstr Surg. 2011 Apr. 127(4):1447-59. [Medline]. Kwok AC, Agarwal JP. Unplanned reoperations after microvascular free tissue transfer: an analysis of 2,244 patients using the American College of Surgeons National Surgical Quality Improvement Program database. Microsurgery. 2015 Jul 21. [Medline]. Coskunfirat OK, Chen HC, Spanio S, Tang YB. The safety of microvascular free tissue transfer in the elderly population. Plast Reconstr Surg. 2005 Mar. 115 (3):771-5. [Medline]. Karanas YL, Nigriny J, Chang J. The timing of microsurgical reconstruction in lower extremity trauma. Microsurgery. 2008. 28 (8):632-4. [Medline]. Harrison BL, Lakhiani C, Lee MR, Saint-Cyr M. Timing of traumatic upper extremity free flap reconstruction: a systematic review and progress report. Plast Reconstr Surg. 2013 Sep. 132 (3):591-6. [Medline]. Godina M. Early microsurgical reconstruction of complex trauma of the extremities. Plast Reconstr Surg. 1986 Sep. 78 (3):285-92. [Medline]. Pan XL, Chen GX, Shao HW, Han CM, Zhang LP, Zhi LZ. Effect of heparin on prevention of flap loss in microsurgical free flap transfer: a meta-analysis. PLoS One. 2014. 9 (4):e95111. [Medline]. Umezawa H, Ogawa R, Nakamizo M, Yokoshima K, Hyakusoku H. A comparison of microsurgical venous anastomosis techniques. J Nippon Med Sch. 2015. 82 (1):14-20. [Medline]. [Full Text]. Pieptu D, Luchian S. Loupes-only microsurgery. Microsurgery. 2003. 23 (3):181-8. [Medline]. Gurlek A, Kroll SS, Schusterman MA. Ischemic time and free flap success. Ann Plast Surg. 1997 May. 38(5):503-5. [Medline]. Seo MH, Kim SM, Huan F, Myoung H, Lee JH, Lee SK. Analysis of Microvascular Free Flap Failure Focusing on the Microscopic Findings of the Anastomosed Vessels. J Craniofac Surg. 2015 Oct. 26 (7):2047-51. [Medline]. Ashjian P, Chen CM, Pusic A, Disa JJ, Cordeiro PG, Mehrara BJ. The effect of postoperative anticoagulation on microvascular thrombosis. Ann Plast Surg. 2007 Jul. 59 (1):36-9; discussion 39-40. [Medline]. Chubb D, Rozen WM, Whitaker IS, Acosta R, Grinsell D, Ashton MW. The efficacy of clinical assessment in the postoperative monitoring of free flaps: a review of 1140 consecutive cases. Plast Reconstr Surg. 2010 Apr. 125 (4):1157-66. [Medline]. Abdel-Galil K, Mitchell D. Postoperative monitoring of microsurgical free tissue transfers for head and neck reconstruction: a systematic review of current techniques--part I. Non-invasive techniques. Br J Oral Maxillofac Surg. 2009 Jul. 47 (5):351-5. [Medline]. Wax MK. The role of the implantable Doppler probe in free flap surgery. Laryngoscope. 2013 Dec 21. [Medline]. Lohman RF, Langevin CJ, Bozkurt M, Kundu N, Djohan R. A prospective analysis of free flap monitoring techniques: physical examination, external Doppler, implantable Doppler, and tissue oximetry. J Reconstr Microsurg. 2013 Jan. 29 (1):51-6. [Medline]. Bui DT, Cordeiro PG, Hu QY, Disa JJ, Pusic A, Mehrara BJ. Free flap reexploration: indications, treatment, and outcomes in 1193 free flaps. Plast Reconstr Surg. 2007 Jun. 119 (7):2092-100. [Medline]. Valauri FA. The use of medicinal leeches in microsurgery. Blood Coagul Fibrinolysis. 1991 Feb. 2(1):185-7. [Medline]. Kruer RM, Barton CA, Roberti G, Gilbert B, McMillian WD. Antimicrobial prophylaxis during Hirudo medicinalis therapy: a multicenter study. J Reconstr Microsurg. 2015 Mar. 31 (3):205-9. [Medline]. Nahabedian MY, Momen B, Manson PN. Factors associated with anastomotic failure after microvascular reconstruction of the breast. Plast Reconstr Surg. 2004 Jul. 114 (1):74-82. [Medline]. Disclosure: Received honoraria from Lifecell corp for speaking and teaching; Received honoraria from Allergan for speaking and teaching.